Whitey has been fishing and hunting for as long as he can remember. A native of St. Matthews, South Carolina, he grew up hunting and fishing with his father, grandfather and even his grandmother on Santee Cooper Lakes. His father was an industrial insulator that fished on the weekends on Santee. Both father and grandfather had houses on Santee where the families would gather every chance they had and of course - fish. Whitey's great grandmother bought him his first boat when he graduated from high school. She was an entrepreneur that grew up during the great depression and became a successful businesswoman while instilling simple values in her children and grandchildren along with business sense. She loved to fish and loved to go fish with Whitey. Whitey paddled and fished with a 10ft cane pole for everything. He went fishing every chance he had. He missed his senior prom and several milestones and memories to go fishing. A favorite teacher even called in sick in high school for Whitey to take him fishing a couple of times. In duck season, he received numerous tardies for being late after duck hunting that morning or fishing. Over the years, the technique changed and so did the equipment but he still goes every chance he gets. He's been fishing tournaments for over 30 years all over the United States. Even though his specialty is crappie, he enjoys catching bream, catfish and bass as well. His favorite lakes are Santee, Alabama River, and Grenada Lake. 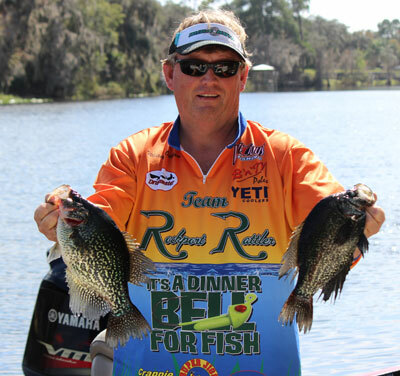 He enjoys teaching crappie technique schools and seminars, working with media and inventing new products for the business. When he's not fishing, he runs his industrial insulation business called Prime State Insulation, which he helped start with his father and grandfather over 25 years ago. He is married to Brandi Outlaw and they have three children. The family is members of First Baptist Church in St. Matthews, SC where they attend regularly. He loves listening to old country music, loves to dance to beach music, and loves watching westerns especially anything with John Wayne! Whitey's other hobbies include cooking, traveling and telling stories. All who know Whitey know that he always has a story to tell that will entertain all!